1. Which Are your 2 Most Used Fuji Lenses? Keep In Mind: it's not about your favorite lens, not even about the lenses you own... this is all about the lenses you use the most overall! Since both were my 2 first lenses, it is kind of hard to beat them with more recent lenses. Voting does not work from Tapatalk. My mostly used: 2/18 and 1.4/35. The two lenses I purchased back in 2013 with my X-E1 was the 18-55 (Amazing lens) and the 35 1.4 (also amazing). Since then, I've added several others, but the 18-55 and my 16 1.4 are the two lenses I would pack if told I could only take a couple of lenses. If I had to choose ONE only, it would have to be the 18-55. 23 1.4 and 56 1.2. The 23 is my go-to walk around lens, and the 56 is my go-to for portraits. Before I picked up the 56, it definitely would have been the 35 1.4. But since getting the 56, I've only used the 35 twice or so. Most used are the 23 and 35 f/1.4, but if asked for my favorites, I would say 16 and 55-200. Those 4 lenses make up my normal walk around kit, with a prime on my X-Pro2 and the 55-200 on the X-T1. 23mm f/1.4 and 18-55mm f/2.8-4.0. But the Samyang 12mm f/2.0 probably was used more than the 18-55 in the last months since I had covinced Santa that the Samyang would make a nice Christmas present for me. In fact, when I put it on my wish list it was more to round up my focal lens range. I had never expected that it would become one of my most used lenses. Therefore I would like to ask the administrator to add lenses to the list that are not manufactured by Fuji. I think all lenses that support full communication and function with the camera like the Zeiss Touit do defenitely belong on the list. The Samyang 12mm probably as well. According to this and other forums (or is fora really the used form?) the 12mm Samyang seems to be integral part of the Fuji lens line up even if Fuji themselves may see this differently. 35 f/2 just because it's so light and I bring it with me everywhere pretty much. Then 16-55 as I take this with me whenever I travel with my family and I know I will want to take some photos. I love the 16mm followed by the 35mm f2. They are always on my X-Pro 1 or X-T1. Next is the 18-55 as its a workhorse zoom for me. 16mm hands on. It is my always on lens. Next to that is the 16-55 if I need a bit more range. The XF23 is more or less glued to the camera. 35 1.4 and the 56 1.2. Actually, the 23 f/2 attached to my X100s is probably most used lens. ExposurePlot told me that my guess was wrong. Actually my most used lenses are the 18mm and 27mm. The 35mm only takes the 3rd place. Shows that most used and most liked are two different things. 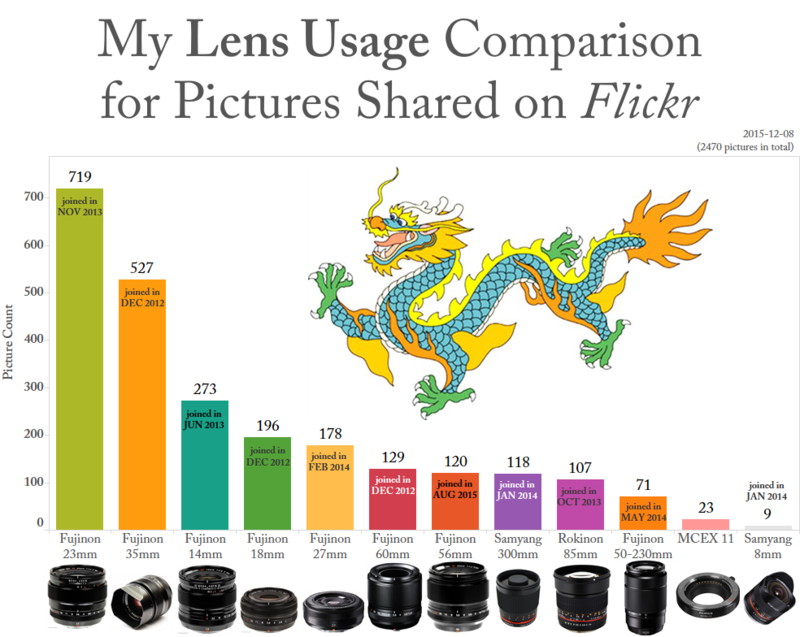 It's only for photos shared on Flickr, but it reflects more or less what's going on in terms of lens usage. My two most used Fujinon lenses are now the 60 mm 2.4 and the 33 mm 2.0 ... which happens to by my X100T with the tele conversion lens.